Vishal Agarwal | Entrepreneur and Digital Marketer | Vishal Agarwal is an entepreneur and the founder of Checkmate. Vishal Agarwal is an entrepreneur and digital marketer based in NYC. As the EVP & Chief Marketing Officer at Choxi.com, Vishal has spearheaded one of the fastest growing e-commerce company’s digital marketing efforts. Choxi was awarded the top digital marketer by Internet Retailer in 2014 and has raised $52 million in VC funding. Working in a startup like Choxi taught Vishal how to explore and find the right answers. This skill, combined with an analytical, disciplined, and numbers-focused mindset culled from four years at Citigroup, gave Vishal a cohesive business perspective and inspired him to think about starting his own company. His experience with Choxi gave him a vision of how a company can and should be run, and reinforced how exciting and crucial it is to work with people smarter than you so that you can always learn and grow. In 2016 Vishal Agarwal founded Checkmate (www.itsacheckmate.com), which aims to improve the “in-dining experience” of customers while they dine out in restaurants. Vishal noticed there were many technology companies solving for aspects like food delivery, back of house and reservations in the food-tech space, but no one was looking at improving the in-dining experience of a customer once they were sitting inside a restaurant. This process has many inefficiencies, such as a lack of personalized service, customers having to look at a physical menu without knowing what kind of food they will get, and the end of meal moodkiller of waiting for check and splitting the check. Checkmate aims to solve those – one step at a time. Can we make all these experience improvements and also reduce the burden for the restaurant staff? Yes, we can! Vishal’s goal within the food-tech space is to remove the stigma of technology as an alien element that’s simply too hard, expensive, or cumbersome to fully implement– he even wrote an article about it. However, it’s not completely the hospitality industry’s fault. It is the tech industry’s responsibility to spend more time on the floor with the restaurant staff learning about what really ails them and solve for it, and then incrementally advance the use of technology. Today most of us use our smartphone 50 times a day without thinking about it as “technology”. That is how it should be – it should seamlessly integrate in our life without making us think twice about it. AI has been in the news of late but the event where Google’s DeepMind beat a Go player really stood out as a defining moment. An NY Times article in 1997 mentioned: ‘’It may be a hundred years before a computer beats humans at Go — maybe even longer.” And it was done in less than 20 years. And then tech industry leaders like Google open sourcing their AI (Tensor Flow) just marks a huge advancement in terms of where the industry can go from here. Google, Facebook, Apple and Microsoft have just been so active in this field, and judging by this Economist article it seems like its time has come. The hardware and the software are both required to make this happen and it seems like finally at this epoch, we have both. Technology makes our life very useful and productive. It enables us to do 10x the amount of work we could do in the past – and “work” here means more than just earning a livelihood: being able to stay in touch with friends and relatives, being able to do something good for the society, travel, enjoy what we love, keep track of the scores of our favorite games. Technology is what is advancing humanity as a whole and it will only get better from here. 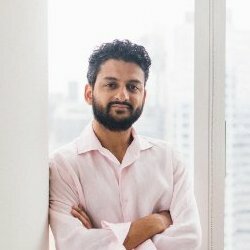 Vishal Agarwal, a non-engineer who has worked in the ever-evolving tech space for over 5 years, has built his business strategy on a strong foundation: hiring strong engineering talent, building a good team with strong communication culture, comprehensive data collection and data based decision making process. Entrepreneurship requires the ability to decide your own priorities, and being able to discuss and determine this process with a well-assembled, smart group of people is what is most rewarding. Vishal Agarwal studied Commerce as an undergraduate at Delhi University and graduated with honors in 2003. He earned his MBA in Marketing from the K.J. Somaiya Institute of Management Studies and Research in 2005. Currently Vishal is focussed on solving the dining experience for customers and likes to share his experiences of working in a corporate setup like Citigroup (e-Serve, formerly a part of Citigroup and now owned by TCS) and then being a part of the founding team of a startup like Choxi. His articles have been published in TechCrunch, Entrepreneur and Forbes.